How easy is it to start a new tradition in your family? Are you met with doubt and resistance? Or acceptance and an open mind? My family stays pretty close to their comfort zone (I definitely didn’t get my sense of culinary curiosity from them). This is especially true when it comes to holiday desserts. There are certain expectations. You can try something new. Although, it works best when it’s merely a different take on something familiar. Like when I introduced them to Spiced Sweet Potato Bundt Cake years ago. It’s been a staple ever since. Last Thanksgiving, I strayed from these guidelines. I also made a Cinnamon Applesauce Cake with Penuche Frosting. I knew they would like the brown sugar frosting and the cake had a good flavor that got better with time. Yet, no one was willing to try it until I sold the description. Of course, once they did, everyone liked it. This year, I will bake what’s expected of me. And, I’m considering this Spiced Apple Cake with Brown Sugar Cream Cheese Frosting. I know, I know. It’s still outside the guidelines. So I made a pre-Thanksgiving version as a test, judging the cake through the eyes of my family. Once the apples were prepped, the recipe came together quickly. My changes started off minor. The yield was a two-layer cake or one 13 x 9 pan. Since this was a trail run, I halved the amounts for a one-layer 9″ round pan. I reduced the salt, using only 1/4 tsp. I’m beginning to think I’m more sensitive to salt, 1/2 tsp seemed too much for a single layer. I sifted the dry ingredients over the apple mixture. I kept pecans as the mix-in, though walnuts or cranberries were optional. I reduced the oven temperature to 325 degrees for the pan’s dark coat. Baking time was 35 minutes. 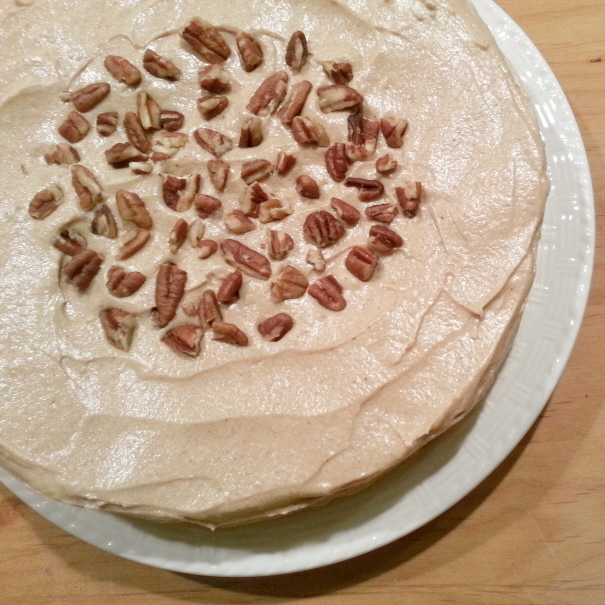 I prepared the full amount of frosting while the Spiced Apple Cake cooled. When its consistency was light and fluffy, I scooped a spoonful. To my surprise, it was smooth, not rich. Subtle, not sugary. It had no defining flavor. I could already see the quizzical looks on my family’s faces. Following pure instinct, I added 1 tsp of cinnamon to the frosting and tried it again. Now, we had something. The teaspoon was just enough to make it interesting, without being too cinnamony. 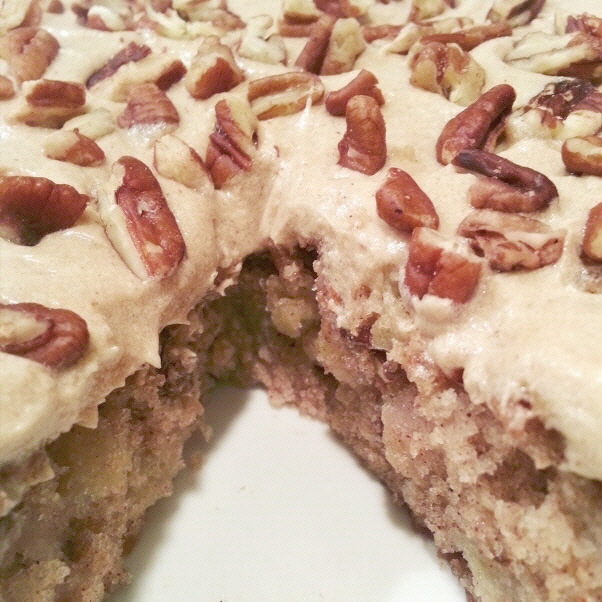 I topped the Spiced Apple Cake with the Brown Sugar Cinnamon Cream Cheese Frosting, and garnished with pecans. Visually, it might interest my family. However, looks meant nothing without taste. Moist crumbs adhered to the knife as I sliced, while random pecan pieces made neatness a challenge. There were soft apples in every bite. And the cinnamon from the cream cheese frosting added a nice spice. So I slept on it, and let the cake’s flavors mingle overnight. The next morning, I had another slice. My first mouthful confirmed the fridge had worked its magic. The apples and pecans had settled into the cake, improving the taste. And the frosting was amazing! The blend of cinnamon, brown sugar, and vanilla created a remarkable spice that captured fall. I give this Spiced Apple Cake with Brown Sugar Cream Cheese Frosting 4 out of 5 stars. I liked the cake and loved the frosting with the added cinnamon. For the full recipe, please visit Price Chopper. Oh, and as for Thanksgiving, I think I’ll go the easier route and stay with the applesauce cake from last year. Maybe it just takes a couple of years to get a new tradition going.